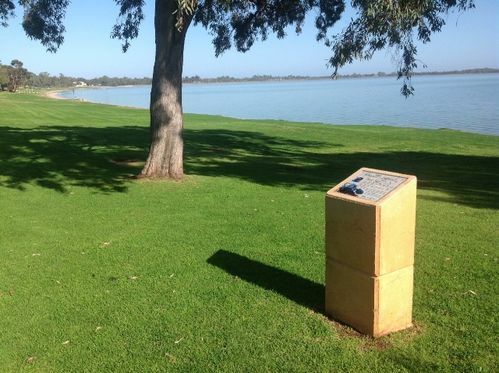 Plaque on plinth erected to commemorate the site of the boatshed used by Donald Campbell to house his hydroplane Bluebird K7 whilst he was at Barmera attempting to set a World Water Speed Record on Lake Bonney. In October 1964, Donald Campbell, a British speed record holder , brought his jet powered hydroplane "Bluebird K7" to Barmera, to attempt to set a new World Water Speed record, on Lake Bonney. The control centre for his attempt was housed at Reg and Gertie Bishop`s boatshed, which also served as a safe storage for Bluebird K7. The boatshed now accommodates the Bluebird Cafe. Many attempts were made to set a new record when conditions on the lake were generally calm and on 23rd November 1964 Campbell set a new Australian Water Speed record of 216mph (347km/h). Unfortunately, the necessary calm conditions never sufficiently eventuated for a new World record to be set on Lake Bonney .